DUBLIN came tantalisingly close to beating Kilkenny in Parnell Park today on Pat Gilroy’s first Championship match as manager in the newly-remodelled Leinster SHC. They led right through the game until Liam Blanchfield’s injury-time goal put Kilkenny into the lead for the first time since the fourth minute, a decisive score of the League champions. Brian Cody’s team, replete with seven debutants, struggled against the Dublin defence, although the performances of Walter Walsh, Eoin Murphy and the arrival of Colin Fennelly saw them through. As expected, Dublin employed Eoghan O’Donnell in a man marking role on TJ Reid. That left a two-man inside forward line for Dublin but it also contained the first half’s most influential player. Both Anthony Daly and Ger Cunningham attempted to make a full-forward out of Liam Rushe during their tenures, with varying degrees of success. Clearly, Pat Gilroy was of a similar mind about Dublin’s only two-time All Star and in the first 35 minutes yesterday, he attacked every ball from the start. Rushe didn’t score in the half but 2-3 came directly off him. Pádraig Walsh, whose switch to full-back has been considered one of Brian Cody’s unqualified successes in this year’s League, was beaten by Rushe four times in the half. Firstly, he set up Paul Ryan for Dublin’s opening goal after four minutes, having waded through three would-be tacklers. And late in the half, as Kilkenny were beginning to come to grips with Dublin’s setup, he put Ryan in again. This time, the Ballyboden man’s shot was saved by Eoin Murphy but debutant Fergal Whitely slashed first-time into the net. 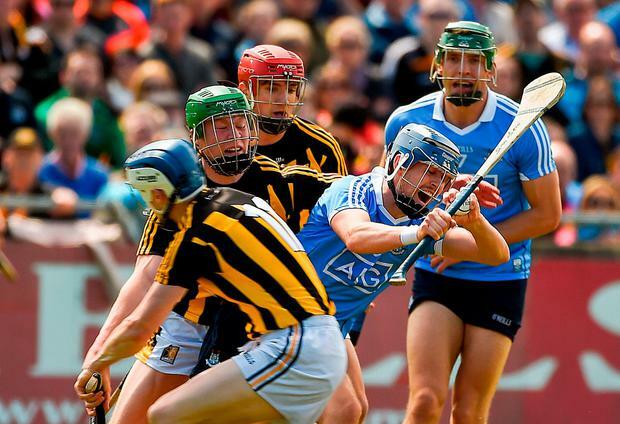 And mostly, Dublin called the tune in that period while Kilkenny reacted. Cody was forced to move Walter Walsh out to prevent Seán Moran hurling at his comfort. The Kilkenny boss also brought on Colin Fennelly after just half an hour, such were the struggles of his newer forward against Dublin’s adhesive markers. Dublin also had eight wides during that period, evidence of some occasionally poor striking but also testament to a stronger all-round display. Still, the feeling that Kilkenny would find their stride, score a couple of goals and pull away lingered around Parnell Park. That atmosphere changed permanently when Dublin got their first goal. Again, Rushe did all the heavy lifting and shifted a ball laterally to Jake Malone, who scored at the second attempt. Dublin hunted in packs all throughout the second half and held their lead until the first minute of injury time. Eoin Murphy put Kilkenny within one with his fourth monster free of the match before Liam Blanchfield stole in behind to score Kilkenny’s goal. Paul Winters pulled one back with a free but Reid hit the final score of a thrilling match.